There is something you can and SHOULD be doing between sets to MAXIMIZE your size and strength gains! Something so simple it’s shocking! Furthermore, if you’re training for maximizing strength and size, those periods of “doing nothing” should be lasting 2 or 3 minutes long. They took 36 trained men and put them on a 16-week resistance training program. The men were split into groups resting for 1 minute, 3 minutes, and 5 minutes between sets. They tested the maximal strength of all groups before the study, 8-weeks through, and after the full 16 weeks. They did this by utilizing leg presses and bench presses to test both upper and lower body strength. I recommend 3 minutes rest between sets for larger compound movements, and 2 minutes for smaller body parts like biceps or calves. However, if you’re completely wiped after a particular set, don’t be afraid to take a little longer if you feel you really need it. This is what is called Maximum Recuperation in THT training. This refers to the optimal rest/recovery period between sets. Remember, this is bodybuilding, not an endurance contest. The stimulus that forces growth is a specific and unique type of stress. So strategies like “super-setting” 2 different body parts is just a terrible idea. You’ve nothing to gain and everything to lose by super-setting. (Don’t confuse this with the “pre-fatigue method”, which is technically an “extended set”, where only one body part is worked with 2 back-to-back sets like my shoulder pre-fatigue recommendation). The message is this: Hit it hard. Then rest. Don’t flex in the mirror. Don’t jump on a treadmill. Just rest up, get your breath back, and get mentally prepared for your next set. Don’t think just because they are bigger than you that they are doing everything right…this is not always the case(probably less often than it is true). See I have seen reports that show minimal rest between sets is good for growth. It can be so confusing with all of the different studies out there. Seems like ppl can always find a study to back up their claims. I actually agree with this one though if you are training for strength. Been a long time follower of your site and although Hypertrophy isnt my main goal at the moment, i always look forward to your blogs and am indebted to your research. Anyway, enough of my sycophant meanderings. The point i want to make is havent we always known that 3 – 5 minutes rest are best for strength training? (i didnt see any mention of hypertrophy in the study) and as we know, strength training and Hypertrophy dont necessarily equate to the same thing. Good read Mark, thanks for the insight. I follow your THT 2.0 to the T for rest periods. i feel I could lift more then just a 1 min rest anyways. But thanks for all your hard work brother. FYI. Two or more exercises performed back-to-back that work the same muscle group are typically referred to as “extended sets”. The difference in terminology helps to differentiate/distinguish this method from “super sets”, which use the same approach, but work different muscle groups. Minor point, I know, but this might help in describing the “pre-exhaust sets”. I agree with this.. Also is it tr ue that if you massage the muscle your working out that it will increase the blood flow? Thanks for the article Mark! To add to the comments, I’ve noticed that when I take longer rests, I can work harder on upcoming sets which gives me more pump… guess sometimes you just gotta do it and see if it works for you since everyone reacts differently. Also, is stretching even bad for you after having completed your workout? what’s the deal w/ that? @MIKE- Agave nectar is a good sweetener outside of your the workout window since it has a low Glycemic Index. It should steadily provide energy without a big spike in insulin- that being said, I think *some* fruits (check Glycemic indexes online) are better choices since they too have a low glycemic index and contain micronutrients and fiber. All in all, if you need to sweeten your tea, agave nectar maybe a better choice than honey. Great post Mark, I can attest to it being true! My question – what about when fat loss is the main target? Would you still recommend 3 min. rest? Great to reinforce the rest time Mark. I’ve been shortening mine, was just getting laxed on timing myself. Will be more strict on rest in between sets!! As always, A Big Thanks Mark!! Not sure if I missed something, but were the training sessions in the study similar to THT where one excercise is completed followed by 2-3 minutes of rest? Just wondering if this is optimal as opposed to multiple excercises a set. I agree – Taking shorter rest periods actually promotes the cardiovascular capacity of a given muscle. That’s fine if your goals are aligned with that objective (maybe for some sports), but for strength and ultimately mass gains, longer rest periods rule. We do not want our heart rate being the limiting factor in how much weight, or how many reps we can perform in a given set. It is also the reason I have developed my cardiovascular system to a higher level – When I take three minutes between sets, my average heart rate for the entire workout is in the 70’s, and I really don’t even sweat all that much – but the “work” is getting completed within a set time frame, and that time frame remains constant while the total volume goes UP – and that is what matters. @David – Strength training is what we are doing for “hypertrophy”, within a “specific” rep range. In other words, it doesn’t matter if you get stronger in the 3-5 rep range or the 8-12 rep range, the goal is STILL increased strength, which EQUALS hypertrophy in the 8-12 rep range, got it? @Spencer – No… Fat loss is something you achieve through MANIPULATION OF DIET… You DO NOT want to train “light” or with shorter rest periods for “cutting” – You CAN, and it WILL burn more calories, but maintaining and GAINING strength are what determine muscular body weight, and that is done through HEAVY strength training in specific rep ranges – If you can move MORE weight because you rested LONGER than that is what you want. As long as you don’t move more weight in a longer time frame. In other words if you curl 2,000 pounds in TOTAL VOLUME in 20 minutes, you need to move more weight in that same 20 minutes time frame – Doing more weight in 30 minutes is not progression, even if the total volume went up. @Rick – But if doing something like “super sets” causes the heart rate to become the limiting factor in how much weight you can move, than you will not progress. In other words, you don’t want to have to stop a set because you’re out of breath due to minimal rest periods between sets – The heart and respiratory system “fail” before the muscle does. Does that make sense? @Javi – Not everyone reacts “differently”, unless you’re biologically or hormonally different than other humans due to some genetic or hormonal defect. Building muscle is not an exact science, but it is still a science. What Mark teaches works for 98+% of people because that is how human biology and physiology “work”. That is why he can back his teachings up with studies. Theories are only fact if they can be repeated successfully and predictably. Building muscle is a very specific process, that has many avenues of attainment, but there are better ways of accomplishing that goal than others, and Mark goes not with what “works”, but with what works THE BEST, in terms of speed and total results. @Dan – The reason for longer rest periods in either case is so that you can lift more weight, do more reps, etc. than if you rested for a shorter period. Lifting more weight ultimately means more strength, which of course means a larger muscle. By taking shorter rest periods you are in effect training the cardiovascular system to become better at providing oxygen to working muscles and removing waste such as lactic acid (via pyruvate), which also requires oxygen. Now this can translate to better delivery and removal upon doing “heavier” training, so it does have it’s purpose, but it is not the best way to get stronger or bigger – Keep in mind the heart is a muscle that adapts and gets stronger like all other muscles. A weak heart (and lungs) can override a strong muscle in any given set, which means stopping the set short of true muscular failure. I also have a question! If you can please answer! Thank you! I go to the gym 6 days a week. On my days off from weight training, i cardio about an hour on those days. at the same time i want to lose weight an gain muscle mass. is this okay? if i continue with this schedule? I cardio 3 days a week. 1 day legs, 1 day lower back/ abs/core, 1 day upper body (chest, arms, back). Thank you again! @Anabolic James- fair point, well made! wonder why its taken so long for this to come to the fore though, as when put like this it seems to make perfect sense. @Anabolic James – Fair point well made! @Ledjo – Pick up Mark’s book THT to get a better understanding of a more efficient way of training than you’re currently doing – You don’t mention specifics (number of reps/sets,etc.). Here is the link – https://www.musclehack.com Go to the right, enter your name and email and download it for free – Start there, and then read the articles on this website – You’ll most likely get the answers you seek – I’m sorry I can’t be more specific, but I just don’t know enough of the details about your goals. I like how you stick to basic training that works! Resting for 3 – 5 minutes will surely result in strength gains and in positive energy balance, in hypertrophy as well at a good rate. However,, scientific research doesn’t really support 3 – 5 minutes intervals maximizing hypertrophy. It does so for strength though – just like in the study you cited! “Furthermore, in terms of chronic adaptations, resting 3-5 minutes between sets produced greater increases in absolute strength, due to higher intensities and volumes of training.” … “When the training goal is muscular hypertrophy, the combination of moderate-intensity sets with short rest intervals of 30-60 seconds might be most effective…” de Salles BF, Simão R, Ribeiro FM, et al. Rest interval between sets in strength training. Sports Med 2009;39: 765–77. You will find the same recommendation pretty much everywhere else too. I think it’s further supported by the use of 1-minute rest intervals by the professional bodybuilders. Both surely work but shorter rest intervals seem to work better. This may be due to sarcoplasmic hypertrophy (caused by challenging the anaerobic endurance of a muscle) being faster than myofibrillar hypertrophy (caused by challenging the absolute strength of a muscle). Whatever the reason may be, it’s probably smartest to use both in the training to also get the benefit of varied stimulus! @Pesseh, regarding your post on 30-60 seconds for hypertrophy. I personally have gotten lots of gains in bulk taking only 60 seconds between sets. I find that my muscles stay pumped and my explosive energy is there. I do lift less than if I do slow and heavy with long breaks, but frankly, strength is not a goal of mine. I could care less how much I can lift, more into the looks part. I love the pump of 60 second breaks. I like that I’m huffing and puffing between sets. I’m also skinny-fat, so I think it’s helping me… I work out in the morning, supposedly when testosterone is higher…. then, I go blasting out sets with 60 second breaks… feels good! Thank you for the respond and I did! or until failure even then i try to hold at failure and continue to push. I’m 5’11, 179lb, i drink about 10-14 glasses of water each day. about 7-8 hours a sleep each night. im active with my job dead lifting and movin constantly. if you need any more info please let me know THANK YOU! am i right in saying that we build muscle by increasing weight/reps meaning that we get stronger..strength = growth ???? @David. Yes, my program isn’t necessarily strength training, so I recommend 2 or 3 minute breaks, depending on the muscle(s) worked (not 3-5 as per the study). However, fundamentally speaking you have to be continually getting stronger to be getting bigger. @Spencer. No. 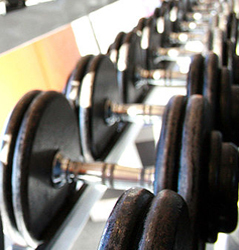 The goal of weight-training, even when cutting, is still to stimulate growth. Diet takes care of fat loss (and even a little bit of cardio). @mike. I know that Dr. Mercola is very much against agave nectar these days. I treat it like all sugars, a small amount isn’t going to do you any harm. At least it’s low GL. @Javi. You can stretch afterwards if you like. @Tajwar. See my response to Spencer above. @Dan. That info wasn’t available unfortunately. My reading was that yes, it was multiple sets per exercise. @Ledjo. From both of your comments I can tell that you are most definitely overtraining. 6 days in the gym, 3hrs a time, cardio on non-training days. I’d be surprised if you’re gaining any muscle at all. You should read some of my articles on this site regarding cardio, overtraining and so on. Better yet, get Total Six Pack Abs for a full, scientific way to blast fat. @James. I was simply defining the difference between extended sets and super sets. No offense to Mark (great article, btw) but the paragraph where he’s discussing super sets and his pre-exhaust/failure sets is unwieldy. Because he’s exactly right, super sets aren’t a good idea in my opinion either. But extended sets can be useful. Exactly as he describes the shoulder extended sets he uses with lateral raises followed by overhead presses. I simply thought it would be good to note that it’s not necessary to caveat that super sets can be useful, when in fact it’s extended sets that are useful. In my opinion, the article could have just stated that super sets are a terrible idea, while sometimes extended sets can be useful, such as the shoulder pre-exhaust. The language and point are cleaner and simpler that way, and prevent confusion, but as I said it’s a minor point. I’m not sure how my comment was in any way taken to support super sets. @Anabolic James. All good points, man. Very well said. @Andrew. I have a habit of doing that I think 😉 I see no reason to, but it won’t hurt if that’s what you mean. @Pesseh. My program isn’t necessarily strength training, so I recommend 2 or 3 minute breaks, depending on the muscle(s) worked (not 3-5 as per the study). However, fundamentally speaking you have to be continually getting stronger to be getting bigger. I disagree with de salles in his statement, “the combination of moderate-intensity sets with short rest intervals of 30-60 seconds might be most effective…”. It is, as he says, what MAY be the case in his opinion (he was basing this opinion on growth hormone release, not sarcoplasmic hypertrophy). This hasn’t been the case in my experience. In terms of pro bodybuilders, it just can’t be used in any debate IMO because of the mitigating influence of steroids. The AST (Max-OT) bodybuilders do claim to be natural and take 2-3 minutes rest between sets. So I think 2-3 minutes is the sweet spot because as I’ve said, the bottom line is getting stronger and progressive overload. Regardless, I think you make a good point. @Jason. Yes. I’ll repeat from a previous comment, “…fundamentally speaking you have to be continually getting stronger to be getting bigger.” Progressive overload is what it’s all about. @Rick. Like I said above, I think you made a good point. James has picked you up wrong I think as you were actually agreeing with me. In fact, I changed the wording in the article a little to reflect this. Thanks for the pointer. I intake 40 grams of protein 3 times a day.. my question is can you over do it on protein? My understanding is when strength training your body can never get enough protein, is this true? @Joe – You CAN have too much protein, but it’s quite a lot. If you’re drinking lots of water, I doubt you’d over-do it. 1-2 grams per body weight in pounds is the recommendation I always see. I try to eat at least 1 gram per body weight (174 grams for me) and sometimes a bit more. Mark did an article about not overdoing protein, because protein does affect glucose, albeit less than carbs, but enough to affect your metabolism if you’re eating large amounts…. I’d stick with 1.5X your bodyweight in grams and go from there. They key is spacing it out… eating 30-40 grams of protein every three hours.